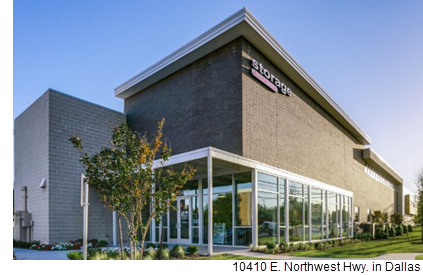 ​​​​​ DFW – A California-based REIT, Public Storage, bought a portfolio of six self-storage facilities in North Texas. The properties total about 430,000 sf and more than 3,300 units. Dallas: 65,500 sf​ at 10410 E. Northwest Hwy. Prosper: 82,948 sf at 1241 Prosper Commons Blvd. Roanoke: 85,400 sf at 855 Lois St.
Rockwall: 72,400 sf at 4028 N. SH 205. Rockwall: 69,350 sf at 660 Justin Rd.